Spring is finally here in my part of the world, and of course that means the urge to do spring cleaning and get organized. If you’re anything like me, trying to get a handle of organizing crochet might be a bit intimidating. There are UFOs (UnFinised Objects) flying all over the place, lots of yarn in random bins and a big looong Ravelry queue. I started to set up a system where I would work on one UFO followed by a new project and keep rotating until I was caught up. But this didn’t incorporate crocheting for charity. I now plan to include finishing up a blanket, hat, scarf or other wearable for charity work after a new project is done. I hope to make this a habit so it’s just second nature. Is crocheting for charity important for you? I know for many crocheters and knitters, charity is close to the heart and a high priority. It feels great to give back just by doing something you love, so it seems important to give charity work its rightful place in planning and yarn stashes. Here are some simple steps that are helping me get organized to crochet for charity. Bookmark or Pin the websites of charity organizations that request crocheted blankets, hats, etc. Some charity sites have suggested patterns that are tried and true. Pick one charity to focus on at a time. This nice long list of charity programs that accept crocheted items from the Crochet Guild of America is a great resource. Some charity organizations require that only certain yarns be used, especially for chemo hats and preemie blankets. Know which type of yarn you can use for their crochet projects and stock up on that. This is essential because some charities have specific requirements due to who will be receiving your finished object. Some might need to be easy care, so they request acrylic only. If you are making chemo hats, the charity organization might have very specific requirements for materials used because they have to be super soft and not itch. See Knots of Love’s required yarn list, which gets updated frequently. Set a goal like filling one box or making 10 blankets in 2 months and decide when to work on these projects, like every other crochet project or a few at a time, etc. Dedicate a spot in your stash just for holding the charity yarn and your finished objects, maybe a pretty basket you will pass by often to remind you. If your comfortable with sharing your charity work, share your progress with others. Consider forming or joining a local group for extra motivation and to combine forces. 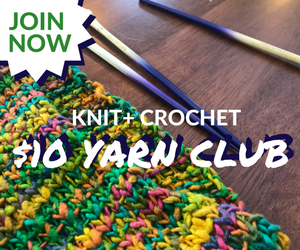 Local libraries may have monthly crochet and knitting meetups that focus on work for charity organizations. If bigger projects seem intimidating at first, look for a group that pieces together crocheted squares into afghans to donate. Creative Commons license, kpwerker via flickr. If this seems like too much to commit to a first, check out groups where you can send squares to be assembled by others. Projects like this go quickly and can be lots of fun. A daisy afghan made of squares from around the world and assembled by Krochet Krystal. Afghans are donated to children’s hospitals and cancer centers. Image used with permission. Krystal posts progress pictures and a list of where the square have come from. It is heartwarming to see the list of various countries that the squares for one afghan came from. There is lots of support for this pattern in Krystal’s Charity Daisy Ravelry group. There are so many more organizations and groups. If you are interested in crocheting for charity, the possibilities are practically endless. I hope this helps with your charity goals. Do you crochet for charity or plan to? Tell me about some of your projects in the comments.